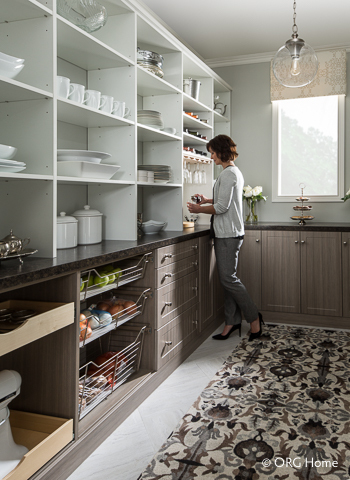 Whether you’re hosting a dinner party or just preparing your daily meals, a built-in butler’s pantry can transform simple storage into a space that streamlines your tasks, shows off your style, and lets you entertain graciously. Here are a few pro tips to consider when planning your home pantry. A built-in wine and stemware rack keeps supplies close at hand so you’re always ready to raise a toast. Add an open countertop where you can invite guests in to chat (and admire your pantry) as you prepare their beverages. 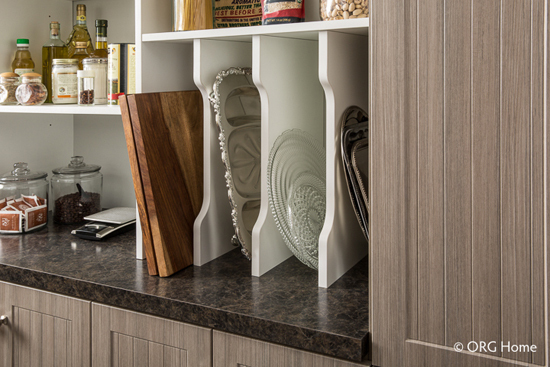 Instead of storing decorative trays and cutting boards in a drawer, use vertical dividers to keep them upright, organized, and easy to see every time you walk by. Keep your specialty tools close at hand without cutting into your prep space. Deep pull-out drawers can hold small appliances like blenders and mixers when not in use, so your countertops stay open and uncluttered. 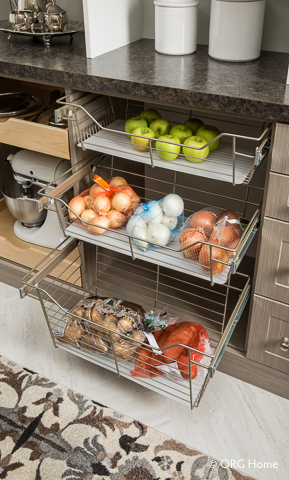 Consider pull-out wire baskets for storing produce. Their full-extension glides make it easy to grab a snack or restock, and the see-through design shows off the seasonal colors. Tuck mops, brooms, and other cleaning supplies into a tall cabinet within your pantry. They’ll be hidden from sight but easy to reach when you need a quick clean-up. A home pantry can be so much more than a place to store your food. Beautifully designed storage solutions can make your home elegant, efficient—and always ready to entertain!